Happy New Year Food Book Followers! Hope you all had a nice break and got lots of time with loved ones. I had a wonderful last couple weeks of 2014 and am looking forward to what 2015 brings. Only one more day and I will be back to my reality of crazy busyness. Unfortunately I will continue to likely be too busy to create much of anything new and post between now and April but, I do have a few new recipes from the past few months jotted down to share and will do my best to get them out. Each year I have created healthier versions of holiday baking classics and posted but this year, with my time limitations and being in the midst of exams until mid December, I had to do something a little different. I actually didn’t do ANY baking this holiday – gasp! I did however make massive quantities of my sprouted buckwheat granola and jarred that for my friends and family. I have meant to post this simple recipe for a while now, the main reason I haven’t is because I never measure what I put into it. Now, I am giving you measurements but I encourage you to splash, sprinkle and pinch to your own liking rather than just following the recipe. I prefer my granola lightly sweetened, for the purposes of gifting and this recipe I made it a bit sweeter. Its nothing like you’d find in a store bought version as far as sweetness goes so if you prefer little sweetness too the measurement I provide is probably sufficient. You can always adjust if you wish on your next batch. To sprout buckwheat, or any grain for that matter, all you do is soak, rinse and repeat until the grain cracks. With buckwheat this usually takes about 3 days. If you look closely you will be able to see some tiny sprouting tails. 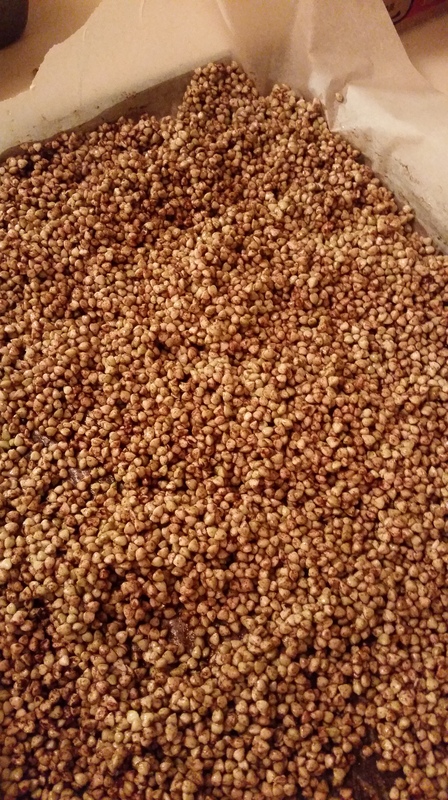 Buckwheat groats give off a really goopyness while soaking, just keep it covered with fresh water on your counter for 3 or so days, rinsing it and covering with new water each day. When it is done soaking and just sprouting, rinse well and strain well. Sprouting is so great. The health benefits are numerous, it can turn a hard-to-digest whole buckwheat kernel into a light, nutrient-dense whole grain. All grains contain certain anti-nutrients inherent in the seed. These anti-nutrients preserve the seed until it has a chance to germinate and grow. By soaking and sprouting you reduce anti-nutrients and make the grain more readily available and digestible. That’s all I’m going to write about sprouting benefits right now, if you are looking for more, Google has it covered. But whatever you do, DO NOT skip this part for this recipe! 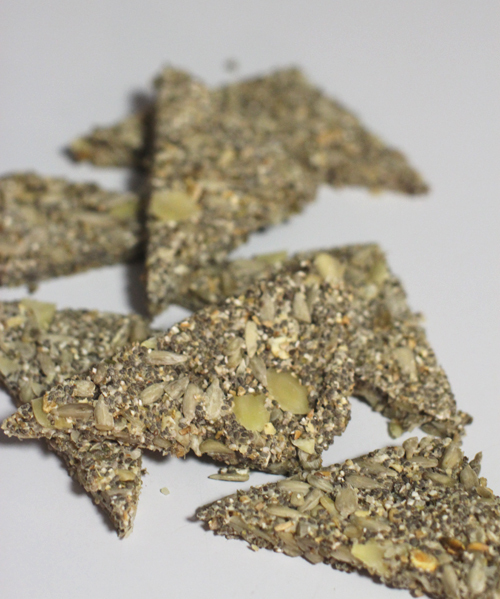 Oh yes, and use raw buckwheat groats, toasted will not sprout, and, use all organic, quality ingredients! This recipe is dehydrated in the oven, I have posted before about using your oven for dehydrating. If your oven sets as low then you are good to go at about 150 degrees, just set it and keep an eye on the dryness over the next couple days. If your oven only goes as low as 170 or so degrees as my current oven does, it is still totally doable, just use a metal spoon or utensil to keep the door cracked open which allows moisture and extra heat to escape. 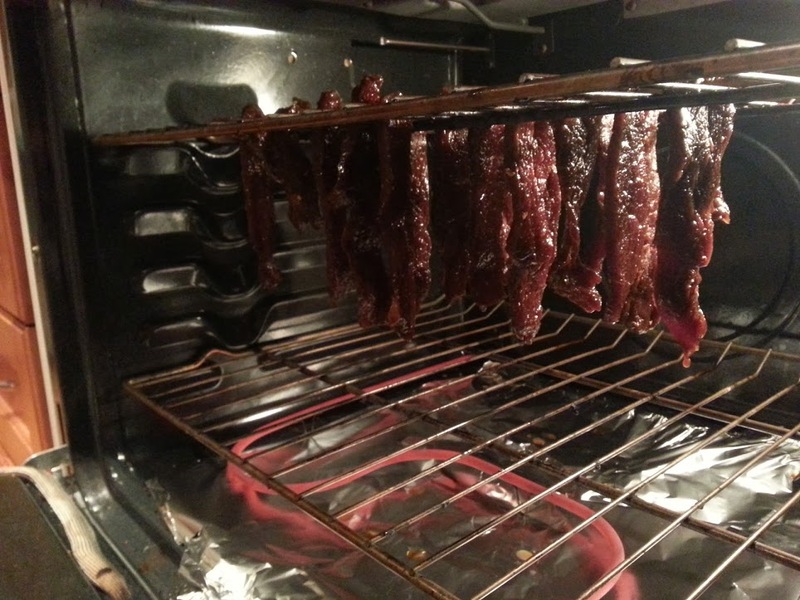 This recipe usually takes about 48 hours to dry out. If you do a double batch, (which I often do) it might take longer but just keep an eye on it. Combine buckwheat, melted oil, maple, cinnamon, and sea salt then divide on two parchment paper lined baking sheets to dehydrate in your oven for 24 to 48 hours. (I love cinnamon and always sprinkle extra on top before putting into the oven). When done drying combine with the hemp and chia seeds and chopped dates. Well I’ve just been too busy to create or post any recipes, I moved from an apartment into a house with a huge yard and besides that being a ton of work in itself I planted a huge vegetable garden, very exciting and having my own organic fresh veg, fruit and herbs to work with is awesome. I am off today to my family cabin for most of August so I was up late last night blending my green smoothies for freezing and making breads and crackers. The recipe below is one I created from gluten-free bread and cracker recipes, it’s kind of a cross between a cracker and a bread. Very filling and nutritious, loaded with protein, healthy fats and fibre. I used my fresh herbs but you can use dried if that’s what you’ve got and feel free to experiment with different herbs or flavours. You can top these gems with most anything, I love them plain or avocado spread on top. Hope you enjoy them as much as I do! Grind your oats and buckwheat in a high powered blender or food processor until you get a flour. Move to a large bowl, add remaining ingredients and mix well. Transfer to a coconut oil greased baking sheet and use a spatula to spread and flatten. Sprinkle with some more sea salt and bake for approximately 25 minutes or till firm to the touch. 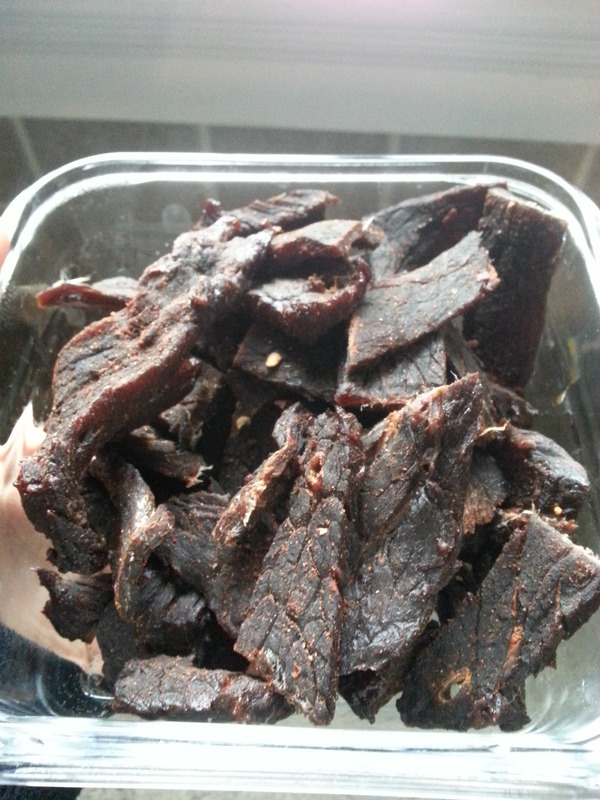 All to cool for a 5-10 minutes then cut and transfer to cooling rack. Store in the fridge for a few days or freeze. *Addendum : You can make quick nut milks (no soaking required) with just a nut bag and a good blender. Creamy nuts like Cashews and Macadamias make great milk for coffee, tea, granola or smoothies. Don’t be afraid to experiment either, I like Cashew Almond or Macadamia and Toasted Coconut, simply toss 1/2 – a full cup of nuts with equal parts water (less or more depending on the thickness you desire), a pinch of sea salt, flavour if you like: vanilla or cinnamon and/or sweetener like honey or stevia and blend until smooth. Sheeze through the nut milk bag and you’re done! I’ve been meaning to post these simple instructions on how to make your own nut milk for years, if you Google almond milk recipes you’ll find pretty much the same instructions, its super easy and much healthier and tastes fresh. You can make any sort of nut milk you like, Hazelnut is awesome, Walnut for an another example, Pecan, Brazil Nut, Macadamia, Cashew, the list goes on, or, mix more than one nut together like Almond Hazelnut! Yum! Beware this is raw, natural food so it will only keep for 3-4 days (as real food should). 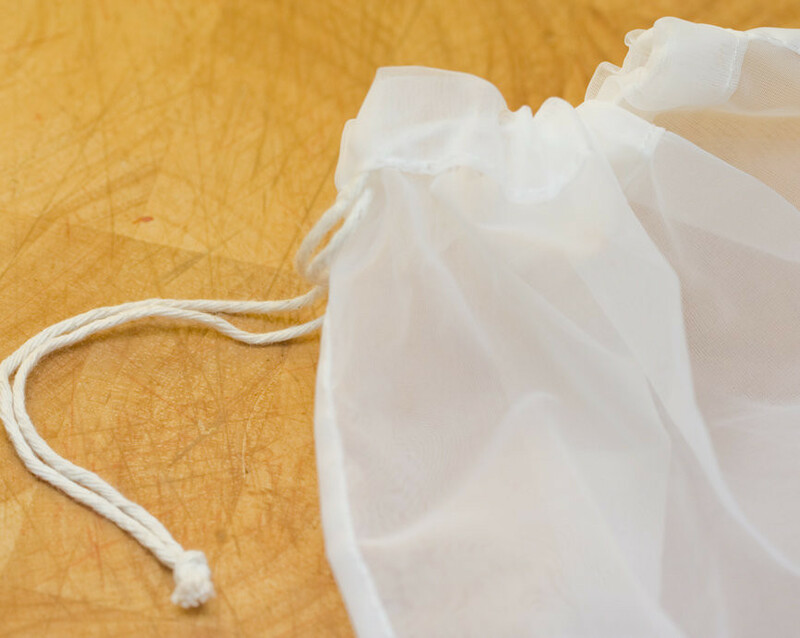 I used to make my nut milks with layered cheese cloth, its super cheap, you can buy it at a hardware store but eventually I bucked up and bought a re-usable nut bag, and honestly it’s well worth it. Look for future posts on using the left over nut pulp! Healthy Sweetener of your choice: stevia, coconut sugar, honey, maple or add dates to the soaking nuts and blend too. Soak the almond in the filtered water over night or for 8-12 hours. Rinsing and replacing the water at least once is a good idea. Drain and rinse your soaked almonds then blend with 4 cups of fresh water and sea salt on high for 2 minutes. If using a regular blender (not heavy duty, like a VitaMix) you may need to do two batches, blending 1/2 at a time. Strain the milk from the pulp using your nut milk bag by squeezing as much of the milk out as possible. Add vanilla and sweeten to taste if you desire. Reserve and store the pulp in the freezer to make other delicious recipes like crackers, cookies or bread. Put this little recipe together this morning when I woke craving a muffin, kinda random but I take it as a challenge, plus, I bought a container of Organic Blueberries this weekend that were super tasty and would be perfect addition to a muffin recipe. I like the challenge of using what I’ve got kicking around to create new recipes and I also have some Almond pulp/grinds left over from making almond milk (a recipe I will also post) to use. You can sub in fresh ground almonds if you like, in fact, the muffin will probably taste even better, fine grind though! I used a frozen banana in this recipe but you could sub in sweet potato puree or apple sauce if you have that instead. I’m going to make these next time with fresh cranberries and orange next time. Have fun, and enjoy! Combine dry ingredients. Mix wet ingredients. Fold wet ingredients into dry. 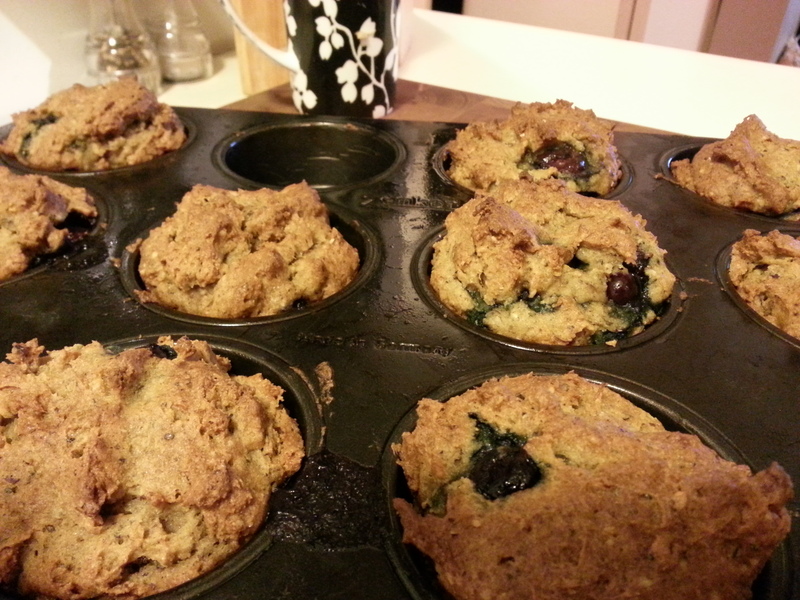 Scoop batter into muffin pan and bake for 15-20 minutes. 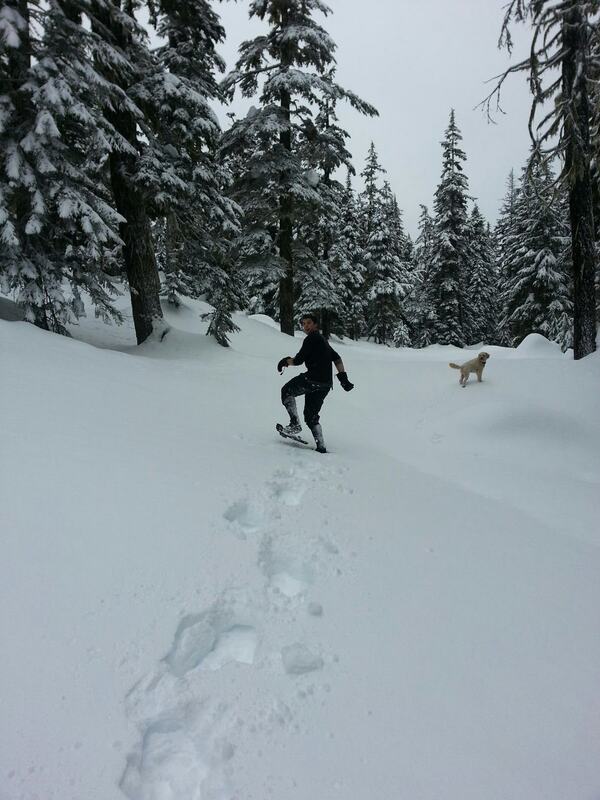 This weekend I went snowshoeing with my boyfriend and decided to make him some protein bars for the trip. I used my tried and tested granola bar recipe and worked on a new creation raw bar from researching other recipes I found online. I love the home made granola bar, it is such a flexible recipe, you can really change the flavour every time you make them and they are really nice a crunchy. You can add your favourite protein powder and a little extra coconut oil or leave them the way they are. They are much healthier than store bought ones and really easy to make. 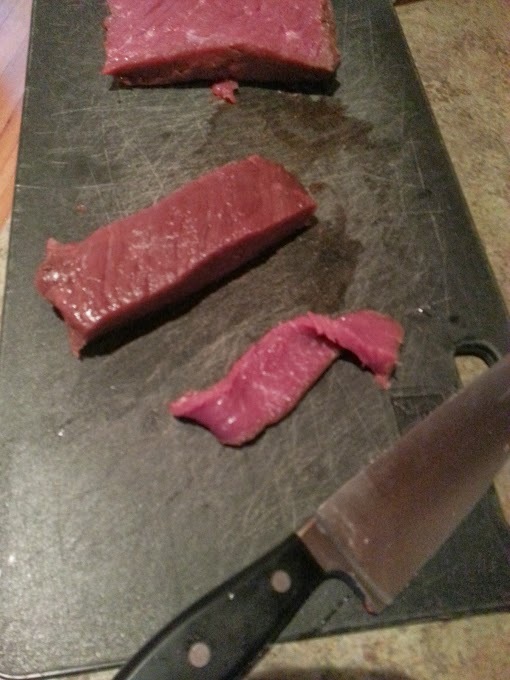 The raw/uncooked protein bar is nice and easy to make too and tastes surprisingly good! Perfect post workout or as a meal replacement to go. You can shift around these ingredients depending on what you have or prefer. 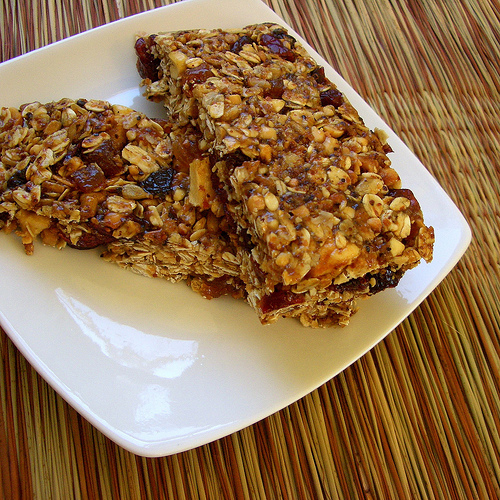 Add 1/4 cup of protein powder with an extra tablespoon of oil for a protein granola bar. 1/4 cup Nut Butter of your choice: Almond, Cashew, Sunflower, Peanut ect. Warm nut butter, honey, brown rice syrup, vanilla, and coconut sugar until sugar has melted. Pour warm onto op the dry and mix well. Once well coated, spread the mixture into your pan. Press down with a spatula or oiled hands then bake for about 25 minutes. Allow to cool completely before removing to cut. Bars will crisp up over a few hours. Note: Mix up your ingredients! Add coconut ribbons or chopped up banana chips for different flavours. Mix all ingredients together and press into a square pan. Chill in refrigerator for approximately 1 hour. Slice into desired sized bar. Store in the refrigerator or freezer until the day you plan to eat one.